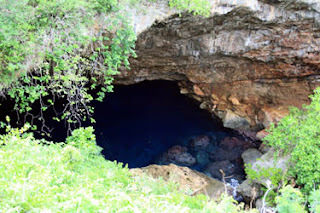 The GROTTO (S)- Considered by many as one of the best cavern dives in the world is a Must Do dive site in Saipan. The Stairs: The 117 steps (I've counted them) that take you down into this huge sinkhole will help you work up a sweat, making the giant stride into the cool water wonderfully refreshing. After the dive most divers bounce back up the stairs ready to change their tanks and to do it all over again. Okay, so they don't really bounce and the 100+ steps feel more like 200 on the way up, but it is part of the experience and I haven't met anyone yet who thought that the climb wasn't worth it! 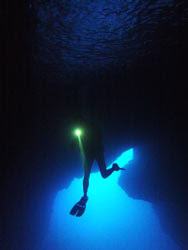 From the central cavern divers can take three different exit holes out to open ocean. Once outside, there are beautiful walls, swim-throughs, and caves to explore. Turtles and Clown Triggerfish are some of the many types of sea life to be seen at this magnificent dive site. Several resident White Tip Sharks lounge on the bottom during the day. Tip: Bring a light. Eventhough this is a cavern and there is natural light to guide your way. You would enjoy looking around in the carvern more if you can could what is hiding in the darker corners. 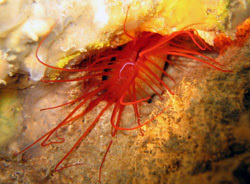 Lots of cowries, nudebranchs, and firescallops can be found inside the cavern. 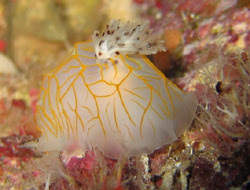 Note: It is recommended you do this dive with a local dive guide, because of the overhead environment and a little local knowledge will make the getting in and out of the water so much easier. 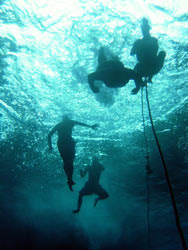 Diveshops use the general guideline that you should have over 15 logged dives to attempt this dive. Current: Inside the cavern there is no current to speak of. Going through the holes you might feel a surge when the water is rougher. On the ocean side the current ranges from mild to moderate.